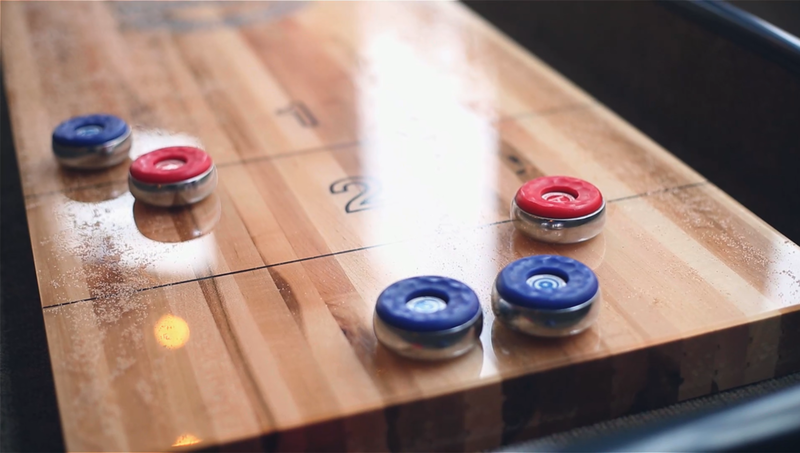 Shuffleboard is the new party game that’s taking off in London. Get a team of friends together and try it out for the first time! It is easy to learn and extremely addictive to play. 2-4 Players. 1v1 or 2v2. To start, both teams take turns sliding each of their pucks down the table. Total up the points after every puck has been used and the LOSER goes first. For a shorter game we recommend playing to 7-11. Great for people who are just starting out and getting a feel for sliding the puck. If 2 players, have one player from each team on both ends of the table. In this round, Blue would collect 6 points. Since Red has a puck nearly into Zone 3, even if Blue had reached the Zone 1 line with its shortest throw, it would not gain any points. In other words, for this round anything scored behind the Red pucks is cancelled for the Blue team. Anything further than all of the Red pucks count towards the total round score for Blue. The WINNER of each round goes first the next round. ONE POINT: Must be on the line between Zone 1 and Zone 2. TWO POINTS: Anywhere in Zone 2 so long as it has fully crossed the ONE POINT line. If the puck remains on the line bordering Zone 2 and 3, it is still TWO POINTS. THREE POINTS: Anywhere in Zone 3 so long as it has fully crossed the TWO POINT line. FOUR POINTS (HANGER): If the puck reaches the end of Zone 3 and hangs off of the end of the table without falling and being knocked off, it counts as FOUR POINTS. Play to 15 or 21. Players on each team alternate turns every throw. At the end of each round, take the total points per zone. The furthest puck in each scoring zone scores that zone’s worth of points for the team. This means all of the furthest scoring pucks per zone are counted each round. For example, if Red and Blue both have pucks within Zone 2, Red’s puck being the further one, Red scores 2 points. Additionally, if Blue has a further puck within Zone 3 in the same round, Blue scores 3 points. Ending this round as 2 for Red and 3 for Blue. 2-4 Players. 1v1, 2v2, or Free-For-All style 1v1v1v1 (Each player has one puck). Choose any score limit. We suggest 15-21. If Free-For-All, playing to 11 is a good limit for a reasonable length game. Highest scoring/furthest pucks go first the following round in order of each player. Every puck in each zone scores that zone’s points. This game mode is best for a wild, chaotic game that allows the score to fluctuate in any round. Every throw counts.